I write/draw/produce for a diverse crowd. On the other hand, there are the rest of us—those that weren't there but for whatever reason—want to learn more about what it was like. In that "rest of us" there are a number of sub groups: warophiles, history geeks, model airplane builders...but the sub group that means most to me are the "family." "I came across your blog when I was looking up my dad's old..."
"Though my uncle was killed, I have always wanted to know how he..."
And "family" doesn't necessarily mean blood-relative. It can mean anyone who's had a profound impact. "My favorite teacher was there during the war and he challenged me to think about..."
Hmmm. About this idea of family, I've learned that the word means different things to people. A few years ago, I was a guest of a Vietnam War fighter squadron and sat at a table with one of the pilots and his wife. We four had ended up arriving late and were seated half-the-restaurant away from the rest of the squadron. I thought it was a bummer because the pilot wasn't with his buddies and I wasn't going to be able to watch the dynamics of the group. Though the pilot received his share of across-the-room hollers and jeers, my wife and I were able to have a comparatively personal conversation. 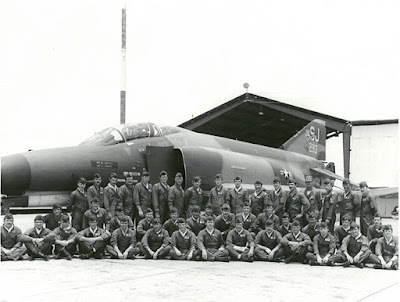 As it was my first real "Vietnam Project" (my words), it was a pretty-great opportunity to learn about the squadron and the couple's perspective on the times. However, I'll never forget a particular moment—looking over at the rowdy group of paunch-bellied old men and their brides, the pilot pointed with his fork and said something profound—"Those are the guys I went to war with. They are my brothers." 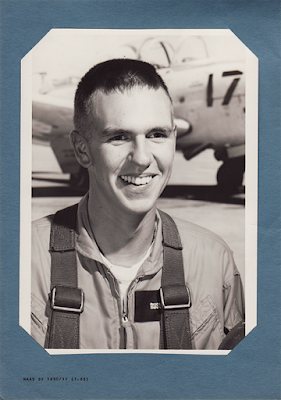 And then, I remembered what the Squadron Commander had said to me on the phone a few weeks prior about the same group—"They are (my wife and my) other sons." Have a look at the pencil sketch above. It's an F-4E Phantom flown by "The Rocketeers" of the 336th TFS, circa August of 1972. Vietnam War buffs will immediately recognize this airplane as Linebacker bird, participating in the period of time between May and October where American air power was launched against North Vietnam's infrastructure: bridges, railways, power stations, fuel storage depots...and of course, the blizzard of anti-aircraft sites that surrounded such targets. On one hand, it's a tool of war. On the other, it's the story of an ex-POW, a MiG killer, ground crew...and a particular man who's name still evokes a cheer. But in the end, this is a story of a bunch of brothers who went off to war. The Rocketeers circa April, 1972. *Sometimes a camera crew, too. Almost done! A few more details, some cleanup...so why not just wait until it's finished? Well, Independence Day is just a few days away and when I think about "all-things-Patriotic," I've come to think of a group of Americans that ironically suffered a dramatic loss of independence during the Vietnam War—the POWs. 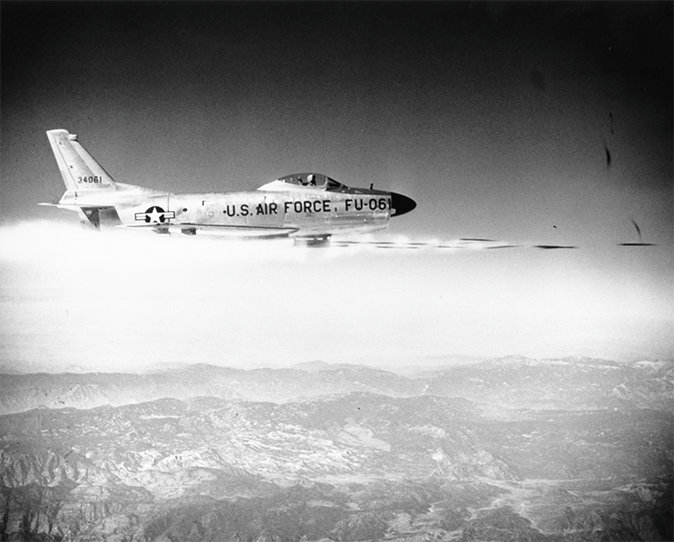 Have one more look at the F-105D above. It's the airplane Gene Smith was flying when shot down over Hanoi on October 25, 1967, beginning nearly six years as a POW. There are a blizzard of tiny details that need to be either fixed or added but I can tell you this—it's going to be a really terrific looking Thud. When finished—and I figure that'll be in a month or so—I will post the final art and the last of my interview with Gene. Hopefully I'll do his story justice as the practical value of what this group can teach the rest of us is not only real but timely. However, can you spare another nine minutes before you hit the hotdogs? The video below contains audio that I recorded while talking with Gene. Originally, I had no intention of using it for anything other than my own reference so I apologize for the poor quality (it's a crappy iPhone recording). But a few conversations with other readers this past week have lead me to believe that this would be valued regardless. Again, I'm sorry for the crummy quality but I bet it'll help you appreciate your Fourth of July in a new way. Vietnam War ex-POW describes being shot down from John Mollison on Vimeo. This is a shorter-than-normal post as the personal story behind the airplane belongs to a family that isn't in-it for the notoriety. 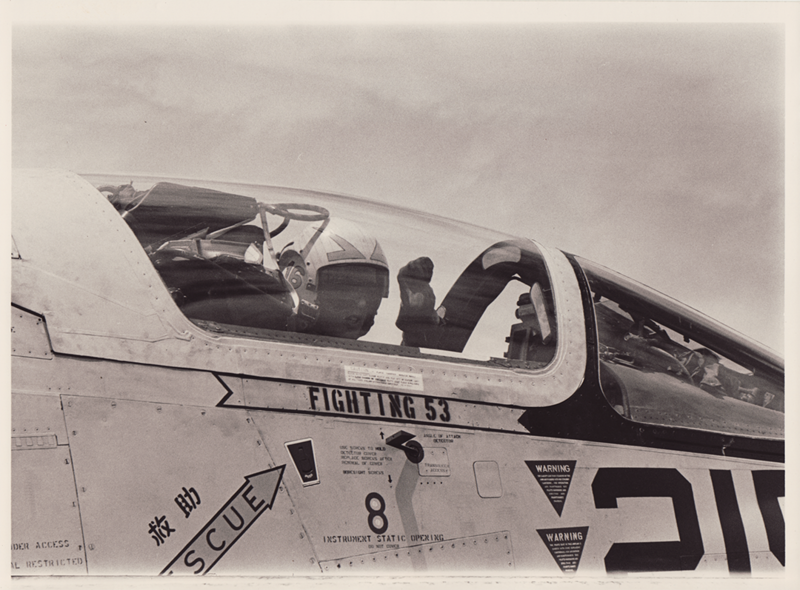 Nevertheless, have a look at the F-86D Sabre above. Historically, the D-model of the Sabre is a quirk of Cold War thinking. The jet served its days guarding America against the expected Russian aerial invasion that, of course, never happened. And when I write "Days", I am referring to the time-scale of all-things-airplane. 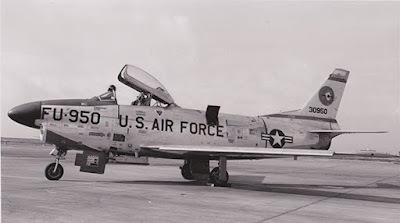 First accepted by the USAF in 1951, the F-86D was mustered out of service by 1956 and disappeared from Air National Guard units by 1961. Compare that to the almost FORTY YEARS of service the F-16 has provided! In the scope of things, the Dog—nicknamed not because of doggish performance but because it distinguished the D model from the rest of the Sabre lineup—was just a blip on the aerial calendar. However, it’s here and that means it’s worth attention. To start, look closely at the nose. See if you can imagine part of the under-fuselage suddenly lowering to reveal a brace of twenty four 2.75" diameter Mighty Mouse rockets nestled in their launch tubes. 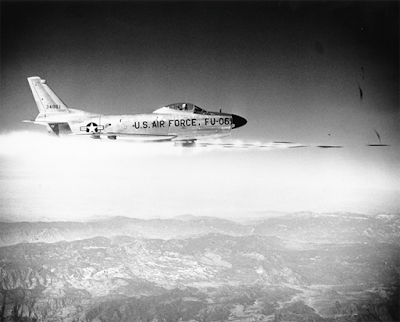 The idea was that the pilot would fire said rockets as kind of an aerial icepick based on pilot acumen and a carefully coordinated ground-control-radar plot. Nowadays, with internally-guided missiles, the idea is awfully clumsy. But then? It was the best solution to counter the desperate image of red-starred invaders crossing the West Coast. but if we don't try stuff out, we'll never learn. Another point of note—mash your nose against your screen and look at all those stencils! You can’t read any of them on my artwork but realize that they reflect the growing complexity of 1950s tech. To get your head around what that compared against the venerable WWII P-51 Mustang, though each airplane occupied similar space (size-wise) a fully loaded Dog was nearly 20,000lbs while the Pony was half that. So where did all of that 'weight' get stuffed? Basically into every nook and cranny and therein lies the reason for all the stenciled warnings and notices. font of the Dogs that came straight from the factory. Ok. Pull your face off the screen and note the color scheme. Though this Dog is appears to be wholly clad in aluminum, the tail is actually painted white. 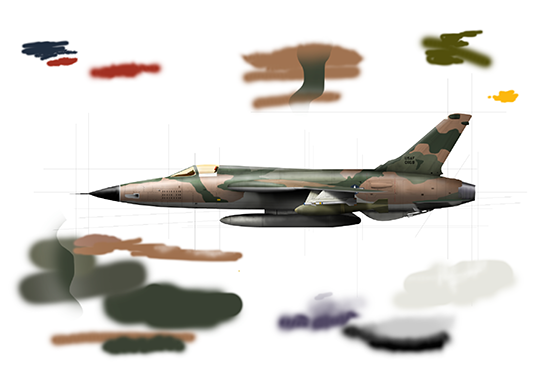 I've tried to make it dingy as a result of the typical level of soot and grime that belched from those early jets but the fact remains, tonally, the tail and body are very similar. Now, note the blue chin—not quite sure why they did it but it looks cool. Many thanks to the Sabre Pilots Association for making me realize it wasn’t black but blue—it’s good to talk to people who were actually there and not try to rely on black and white photos! Yes! It's 950! I'm jealous of anyone who ever got to see this sight as part of their job. Yet, the most poignant point of this post is the title, "Stuff Dad Used to Do." Soon, this print will go up onto a wall at a prestigious military museum as a modest memorial to the men who did their duty in those nervous days of Duck and Cover. 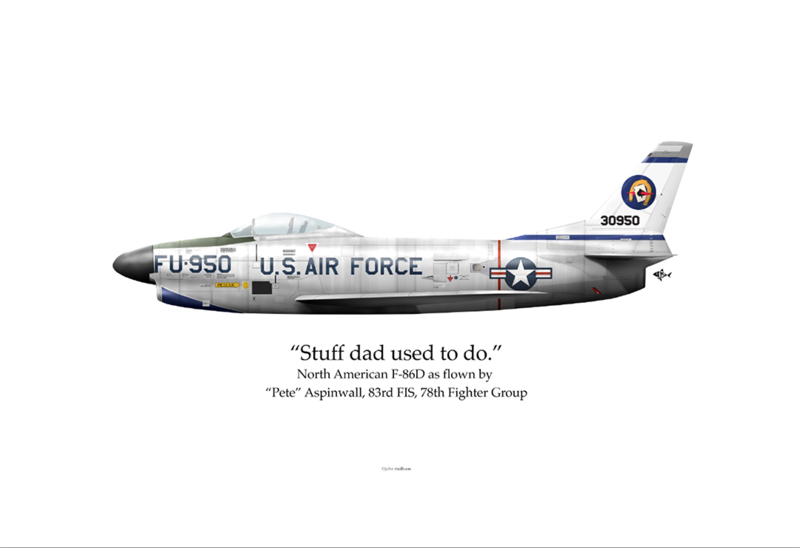 The artwork was commissioned by the pilot's son who, now as a single-father, realizes the burden that parents have in making sure the future is, as well as can be expected, protected. And so, the title. Granted, it's a personal thing that makes most sense to the sons and daughters of military pilots. But, I think it applies to anyone who stands on the shoulders of today, looks down and realizes the ladder of life is not made of metal and stencils...but flesh and bone. 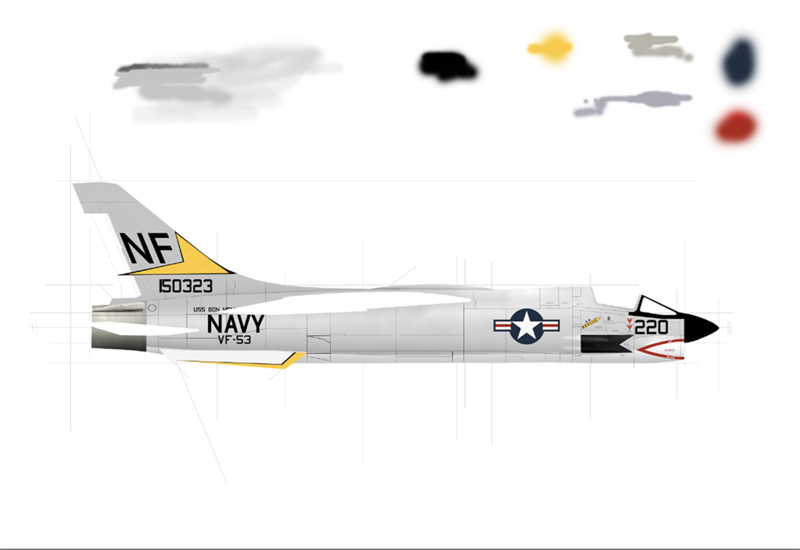 F8 Crusader time! Man, I've wanted to draw one of these sharks since I was 9 years old and struggling to glue the wings on. For some reason, people enjoy asking questions about what I do here. Here's a sample: "Are you really into Military?" Sure! But, I'm not a wanna-be for that matter. The simple fact is that military moments are the crux of human history. Remove them and we're left with a perforated storyline that simply doesn't add up to much. But when taken in-whole, the picture of the human condition becomes much, much clearer. So, to me, "Military" is fascinating. And I think this is the one that I attempted to build as a kid. Though I wholly agree with the Give Peace a Chance ideal, it's also the equivalent of listening to kindergarteners talk about what they'd do with a hundred dollars—"I'd buy all the candy in the world!" We jaded adults know the truth—"Kid, you wouldn't get much and afterwards you'd puke your guts out." In other words, right now, a world without war is simply unrealistic and until the moment when such is eliminated, our goal should be to do it better. For me, writing about the human-side in addition to the war-side is is my contribution to this endeavor; it's awfully hard to make an enemy out of people we know'n like. And, when confronted with those people who are inherently unlikeable (i.e. Nazis, ISIS, Khmer Rouge...) it's all the more enjoyable when they get blown up. Steve Russ, in a condition he describes as, "Younger Me." Therefore, I interview old guys and draw their airplanes and hope for the best. Ok, back to the airplane. Have another look at the Crusader above. This particular example is one attached to the USS Bon Homme Richard (pronounced Bon Ahhm Rish-ard) circa 1968. Her some-time pilot was, in his own words, only remarkable in that he was the youngest pilot on the ship. Over the next posts, I'll try to describe what it was like to fly this incredible aircraft known as "The Last of the Gunfighters." 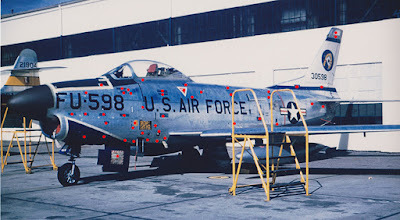 As a war story, I'll share the pilot's perspective on using the machine as a tactical bomber (kind of like putting a luggage rack on the back of a 911 Turbo). And you'll see some mighty-awesome fresh photographs of a day-in-the-life as well. But as a human story, well, as my kids say, "It's complicated." And that means this is a very human story. No. Don't launch...at least not quite yet.